In today’s episode we continue our series on new breed medical device company stories. 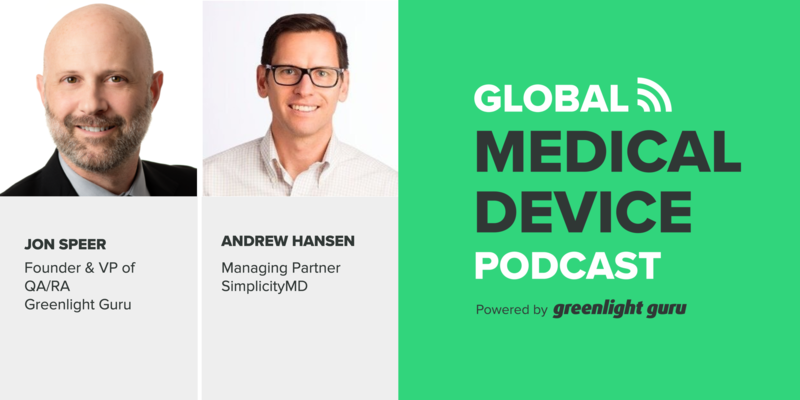 We talk with Andrew Hansen founder and managing partner of SimplicityMD, a lean and efficient organization focusing on getting new products to market relatively quickly while also addressing their quality and regulatory compliance. SimplicityMD develops simple medical devices that reduce health care costs and improve patient care. Their products are developed by a small team of creative and collaborative individuals with diverse backgrounds in medicine, law, engineering, and business. Andrews’s going to talk to us about their company’s story and some ways the organization has been successful going from a startup to where they are today. How SimplicityMD has been working through the process of getting medical devices to market. Some insight on how SimplicityMD has been able to accelerate and get products through quickly. The importance of being deliberate and intentional while going through the process, as well as the importance of understanding the difference between designing and implementing systems. How to prioritize the regulations. You don’t want to spend too much or too little time on regulatory tasks. Thoughts on how to make a company more efficient and lean. Jon Speer: Hello, and welcome to the Global Medical Device podcast. On this episode, I'm real excited to feature another new breed medical device company story. This time we have Andrew Hanson with SimplicityMD. He talks about how their organization is being a lean and efficient organization, focusing on getting new products to market relatively quickly while at the same time making sure that they're addressing their quality and regulatory compliance. So I hope you enjoy this episode of The Global Medical Device podcast. 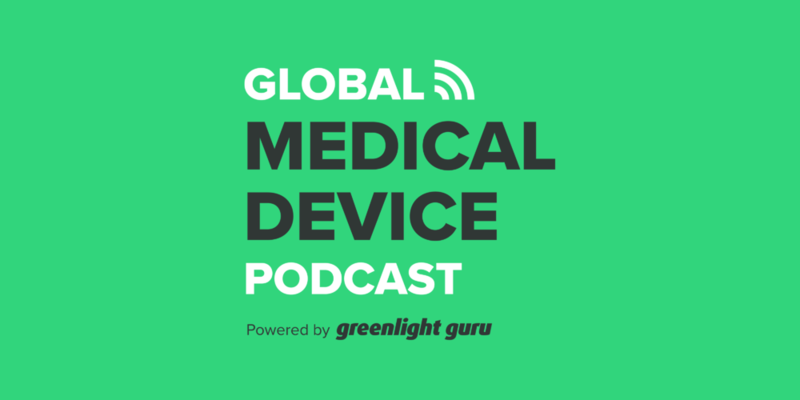 Jon Speer: Hello, and welcome to the Global Medical Device podcast, this is Jon Speer, the founder and VP of Quality and Regulatory at greenlight.guru, and your host as always. I'm excited today. With me on the podcast, I have Andrew Hanson. Andrew is with SimplicityMD. Andrew, welcome to the Global Medical Device podcast. Andrew Hanson: Thanks for having me. Pleasure. Jon Speer: So you and I had a chance to meet recently at the MD&M event, and we had a really great conversation, and I got to meet your colleague, Ryan, as well and I got the nerd out on the prototype device that you had with you, and it just really reminded me of some things that I've worked on in the past, different devices and things. You shared a part of your story, and I just loved hearing the story about how you guys have been working through this process of getting medical devices to market, and I was hoping that you would share some of that with our listening audience today. Andrew Hanson: Sure. I'm a managing partner in SimplicityMD. We're a small medical device company that's trying to develop products, multiple products that are on the smaller end of market size. And so, we're looking for ways in which we can optimize our resources. And one of the things that we decided that we didn't wanna do was build out an extensive quality team and have dedicated people doing quality instead. We wanted our engineers that are doing design to do some of the quality or to handle the quality, but we wanted to make it easy enough for them that they don't feel like they're just a quality person. And we felt that we could get better quality out of our product by having the design engineer be really aware of the issues that surround quality. And so, we've done that now with two products, and we feel like our team, even though we don't dedicate all of our time to quality, we feel like we are better able to build a quality product and comply with the FDA regulations by doing it ourselves. Andrew Hanson: Of course, Greenlight was a critical component to that because there's a lot less paperwork for the individuals and because it's cloud-based, it's easier for us to store the information and to do the review process. So, sure, it's working out well for us so far. Jon Speer: I love working with startups, and those who have been around me for part of the past 10 years knows this about me for sure, but I'm a med device guy at heart, and I'm very passionate about devices that are making a difference. And seeing startups, the things that you and Ryan and your team have come up with has been great for me to kinda live vicariously through you and to go through that experience, but really what made me smile from ear to ear was when you and Ryan have shared over the past year and a half or so, you've shared with us your experience, as you're both new to the med device industry, right? Andrew Hanson: That's correct. I'm actually a patent attorney by training. Andrew Hanson: I did that for about 15 years, and I've now been doing med tech for about three years. And Ryan was a talented engineer, just graduated from University of Utah with an MBA, and we're tackling this together, and it's going quite well. Jon Speer: Yeah, just the depth of knowledge that... You seem to approach all of this with a learner's mind, and that's important. But how quickly you've gotten up to speed and how quickly you've been able to speak the language, for me, it's been really awesome to be a part of that. And I guess as you've gone through this journey, you talked about the quality system and having a cloud-based application that works in the background, so to speak, as you guys are able to focus on mission critical aspects. So you talked about launching a device already and you've talked about developing a second device. Can you give a little bit more insights into... I'm not asking you, of course, to share trade secrets, but a little bit more insights into how you've been able to accelerate and go so fast. Andrew Hanson: Yeah, so our first product that we... I have actually now built three products that have been on our... The SimplicityMD team that's built three products, and there are other... I haven't mentioned them all, but there's three or four other people that are involved in SimplicityMD. Andrew Hanson: In our first product, we did the traditional hire a consultant firm to get our quality system, and we actually contracted with them. They do the quality system. So I had that experience, and I wasn't even responsible for the quality system in that company, but I went to a lot of design review meetings and started to learn the process and I thought, "Wow, this is pretty painful." And so when I was in charge of the next two projects, I decided I wanted to try it a little bit differently. It was a little daunting at first to commit myself, like, "Am I really going to do this?" Because it's serious when you take the quality system on yourself, right? Andrew Hanson: And I didn't know for sure whether Ryan and I could just do it ourselves. And so what we did is we started with a very simple Class I device, the catheter securement device. One piece, no moving parts, and so it's just a listing so we didn't have to do design controls or risk. Andrew Hanson: And so we did that first and that went smoothly and we said, "Yeah, we think we can do this." And we're right now in the second project. It's an adapter for positive pressure masks, and we built a valve in for the elbow to do oral care through the mask. And it's a Class II device and we're about to submit our 510 [k] probably in the next month, and it's gone quite well. It's been pretty straightforward to do our design controls and risk analysis stuff using Greenlight. So we're happy with it. Jon Speer: Good. And I guess the part for me about that story that I like is that... Well, I hope this sounds okay, but you took a baby step first. You cut your teeth on something that was a little bit of a lower risk product, but an opportunity to understand what this process is all about. So you were able to get that to market pretty fast, being Class I device and those sorts of things. But it allowed you... And I know I'm restating a bit of what you're saying but allowed you and your team to get experience with operating under a quality management system and it really allowed you to also work in parallel in capturing the design controls and risk. I think that's smart, you know? I think a lot of times companies, they dream of the biggest, baddest, best device that they could possibly imagine and it's got a lot of features, a lot of bells and whistles sometimes, and it can be challenging. So it sounds like that approach that you took was very deliberate, very intentional. Andrew Hanson: Yes. And in fact, part of our deliberateness is, if that's a word, was that I didn't wanna have to build a quality system, too. There's a difference between... Let me clarify when I say not build a quality system. There's a difference between designing the quality system itself and implementing the quality system, right? Jon Speer: For sure. Yes. For sure. Andrew Hanson: So we decided, well, we don't... And if you buy an off the shelf quality system, they've got their good things and their bad things. But one of the things that we decided we didn't wanna do is we didn't wanna try and design something ourself. I don't wanna become an expert in designing quality systems, I just wanted to implement one. Jon Speer: Right, right. That's a good point. That's a very good point. Andrew Hanson: And you do tweak things as you... In any quality system you're gonna tweak things, right? But I wanted to have the confidence, and that's one of the things that also attracted us to Greenlight was that we knew that as regulations were changing, that there was an expert on the other side that's gonna tip us off like, "Hey, you need to change something 'cause this regulation came out." And I didn't wanna have to follow all those. You have to follow 'em a little bit but I didn't wanna be primarily responsible for monitoring regulations. I wanted to be part of the community that would help me to... Someone tip me off on it. It's about picking the things that you do wanna do and not having to do it, and finding a system and people that can help you do the things that you don't wanna do. So, that works for us. Jon Speer: Yeah. That's so insightful. Once upon time in my life, I like to think I was a pretty good design engineer, but that's not who I am today. I'm not a regulatory and quality subject matter expert, and I'm happy to help you and your team, and as are the rest of the customer success department at greenlight.guru, that's what we're here for, because that's our domain, that's our expertise. So lean on us just like you have, and that's what we're here for. And you know that you guys are brilliant designers and you've got wonderful concepts and you know the space that you're in and you're being very strategic about building a portfolio of complementary products and that's cool, I like that a lot. I like that approach a lot, and it kinda goes back to my roots, the company that I started working with, even though it was a large company at the time, it felt very entrepreneurial. I know we used to go to the American Society of Anesthesiologists and the American College of Surgeon, all these big physician meeting groups, and every time a physician would come up to our booth, they would always ask, "What's new? What's new?" 'Cause they wanted to see, 'cause they knew that was our reputation, and that seems like the kind of reputation that SimplicityMD's building. Andrew Hanson: But at the same time, we wanna have the assurance. I don't even wanna say assurance. There's the regulatory side of things, you can't ignore it. A lot of times people are extreme one way or the other, right? Andrew Hanson: They worry about it all the time, or then they don't worry about it at all. And I recognize that even though we use Greenlight, it's our responsibility to make sure that we follow the regs and that everything's up-to-date, right? Andrew Hanson: But if that's the thing that I don't wanna be an expert at, then by surrounding myself or joining a community or a platform that can help me out with that then at least it makes me a little more comfortable that, "Hey, I can focus on the device and the industry that I'm really interested in and wanna be expert at, and not have to be expert at all these other things without building out a huge organization or hiring multiple people that will manage that regulatory stuff." Jon Speer: Yeah, the model that you're describing, we've done a few other podcasts with other customers who have, we'll just say, similar approaches from a business strategy perspective, and we've really dubbed companies like SimplicityMD and some of the others that we featured as really this new breed of medical device companies. You're setting some precedent in some way, because I think this is the model that is really gonna be successful for growth for companies like yours. I don't know what your long-term plans and I'm not asking for that today, but for success, you gotta kinda bootstrap it. You gotta build it as you go. You gotta be smart. You gotta be intelligent. And I like what you said about kinda being a best of breed. You know what you do well. You know there are others who do some of the other things that you don't do as well or know as well or want to know as well. I'm not gonna be a subject matter expert in everything. You're not gonna be a subject matter expert in everything, so let's collaborate, communicate and figure out how to work together. And I like that a lot. Andrew Hanson: Yeah. I really think it's important to find teams that make your company more efficient and lean, and especially with the things that they're not going to make my product... I'm not gonna succeed or not succeed in the marketplace based off of the type of quality system that I use other than, I guess, if you don't use your quality system, you produce a bad product. That can be bad for you. Andrew Hanson: But most people, I think most companies and the FDA does a pretty good job of getting people to produce quality products and we trade things and we fix problems when they happen. And I think in general the medical community or the medical device community in the United States does a pretty good job of producing quality products. And so in my mind it's about finding a system that can help me do that process more efficiently. I'm not worried about not doing it well, I'm worried about how much time does it take to get it done and how many people do I have to have. Mind you, if I hire a person I have to manage that person, right? Jon Speer: Yeah., you do. Andrew Hanson: So that's the savings for me. And even if it's not an economic savings, sometimes it's just, I can only manage so many things so it makes it easier for me. Jon Speer: Right. That's very true. And I think sometimes companies that... Well, it doesn't matter of the size, but I think sometimes the things that I've observed when it comes to a quality management system, you hit the nail on the head. There's kind of two extremes. Those who, they ignore it, or maybe don't pay that much attention to it, or they just put something in place to check a box. They don't really live it, so to speak. And then there's that other extreme where they've gone overboard, and yeah, they're compliant, but they're not able to do anything because it takes so much time to go through all the hoops and hurdles and obstacles that are defined in their overly burdensome quality management system. So we talk a lot about right sizing your QMS at Greenlight Guru and that seems like that's right where your wheelhouse is as well. Andrew Hanson: Another thought I had on that is I've also noticed that in the industry, there's a lot of people that become expert at regulatory are too risk adverse, especially for small medical devices like the ones that we do at SimplicityMD. Andrew Hanson: And they actually get in the way. And as a lawyer, I was trained as a lawyer, I advised clients and I learned how to take risk smart. Andrew Hanson: You can't avoid all risk. And in patent law you have to do that, because patent lawyers are so expensive, right? Andrew Hanson: Risk mitigation, it's like, "But we're not saying that you have to mitigate every single risk to zero 'cause it just never happens." And so by us taking more control in a reasonable way of our quality system, the executive management, our product developers, and me as a manager of SimplicityMD, we can make much better judgement calls because we're much closer to the quality system because it's not so painful to do it. Andrew Hanson: So I think that's where another really important efficiency comes in in using a cloud-based, and I'll call it Apple-esk quality management system. Jon Speer: Yeah, I appreciate that, that's definitely a huge compliment so thank you for that, and I'll be sure to share that feedback with our team. I know the team at greenlight.guru, we do live vicariously through our customers. One of the things that we do every week is we share stories from our customers, and we live through your milestones and your achievements. So I know our team's gonna be very excited as you march toward that 510 [k] submission, and we're ready to pop a bottle of champagne whenever you get that clearance, 'cause I know that's gonna be a big deal. Andrew Hanson: So are we, I'll be sure to let you know. We're excited, we're closing in on it. Jon Speer: I know. It's real exciting. Yeah. That's cool. And I saw the device, and it was great to be able to meet you and Ryan face-to-face too, because when you get to look somebody in the eye and you get to see how excited they are, both of you had a certain sparkle in your eye about what you're doing. You know you've got something and you know you got a product that's gonna make a difference, and that's a big deal. Andrew Hanson: Yep, we can't wait to get it to market. [chuckle] And of course, finishing our regulatory is the stuff that's getting it to market. Jon Speer: Yeah, of course, of course. I appreciate you taking time out of your busy day to speak with me. Is there anything else that you wanna share before we wrap up our conversation on this episode? Andrew Hanson: No, I appreciate the time you guys take to learn about the companies and developing the product further to meet our needs, and listening to the feedback that we give, and seeing things change in Greenlight over the last year or so, and it's all positive. Jon Speer: Alright, well, ladies and gentlemen, Andrew Hanson with SimplicityMD, definitely check out what they're doing. You can look up Andrew's contact information on LinkedIn, and if you'd like to learn a little bit more about his company, or about his experience with Greenlight, I'm sure he'd be more than willing to have a conversation with you. Jon Speer: Ladies and gentlemen, this has been John Spear, the founder and VP of Quality and Regulatory at greenlight.guru, and you have been listening to the Global Medical Device podcast.